In Lebanon online trade is still in its infancy, but the numbers are good. The annual growth for e-commerce trade is about 9.5 percent. At least 75 percent of the population is active online, which already makes the country e-commerce ready. Your business is waiting for it to go online. Here are the top reasons to begin your free online store at Tjara.com today. Opening and furnishing a new physical store is an expensive mission. You will need more than just money to make it operational. The authorities will want to see permits. Before the store is complete, you will have spent a fortune. And that doesn’t even include advertising costs to promote your business. On the other hand, opening a web portal is something you can learn on your own. You can use various online tools available at Tjara to create your online store. When Lebanon sleeps, the world is still awake. You can tap into the global market by hosting your business online. You can sell anytime you want. Someone can visit the store anytime he or she wants. You can take advantage of the holiday seasons when demand is high. While most businesses are closed during this time, customers are looking for merchandise. But they cannot find a vendor. You probably don’t have a large store because space is premium. You can post a limitless number of items on your portal. You can also make it easy for the customer to choose whatever they want. You can sort products based on price, color, size or any other specification that you deem fit. Online stores offer you an opportunity to keep track of your inventory. Using our refined dashboard, you will be able to utilize powerful tools for managing prices and quantity. And as a bonus feature for selling more inventory, you can set a price range for any product and thus negotiate the final price with any customer! Our real-time notification system will help you track customer bids and messages. Online stores bring together all communication channels together. You can connect social media to the online portal to monitor real-time customer interaction with your social pages, such as YouTube, Facebook or Twitter. You can add a contact us page in the way you would like the person to do that. For example, Tjara has two Facebook pages for Lebanese visitors and international visitors. They do the same with their YouTube content to cater to all customers by providing content in English and Arabic. Customers have to sign up with their contacts before they purchase an item, which gives you valuable data that you can use to send offers and reminders. You can also utilize online product reviews to promote the product. If the feedback is not good, you can use that as an opportunity to improve your services. People expect businesses to have some form of online presence. If a company is lacking in this aspect, people think it is too small to be reputable. But when you have an online store, they are confident that you are an established business. You don’t have to sell to people within your locality only. You can sell to virtually anyone who is willing to buy from you. People buying from outside Lebanon can also participate in this trade. All they need to do is handle the shipping costs. You can leverage social media networks to cross-promote your products. By adding share buttons, anyone who views any of your products can share it with the world. Online portals can help direct people to your store. You can implement the ‘book online and collect at the store’ option. You can also promote the physical store on the web portal to grow your business. Think about the many things that you would want to add to your store, but cannot do so because you don’t have space or license to buy and sell. 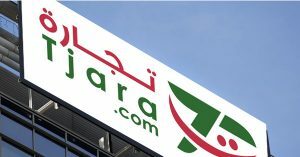 The Tjara platform offers you over 5000 categories to choose from and all you need is to sign up for the free online store. With such a large pool of options, all your products will fit into the most convenient category. You don’t have to mix smartphones with their accessories in the same database. Each can fit in its own category.